Dedicated in fond and loving memory to the dearly departed Woodstock Town Councilman Jay Wenk – a true friend and long-time supporter of Maverick Concerts. Longtime Woodstock Town Councilman and Supporter of Maverick Concerts. The Borromeo Quartet is one of the senior groups now before the public, having launched at the Curtis Institute in 1989, but in their technology they are more up to date than most: they were the first quartet to play from complete scores viewed on computer screens on their music stands. They have been playing this way for nearly ten years now, and are technologically advanced in other ways too. They are keen on music education, and make both audio and video editions of their performances readily available to audiences where they play. The quartet has been widely praised for what the Boston Globe has called “edge-of-the-seat performances,” of which they deliver about a hundred every year around the world, in countless music festivals and concert halls. 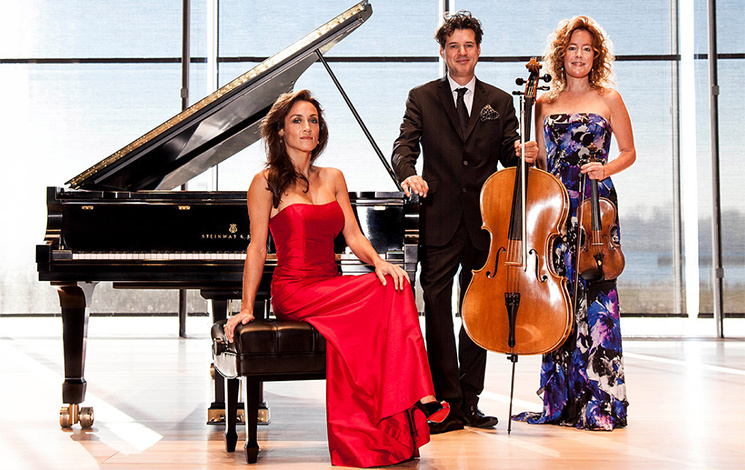 Their career was launched by winning the Evian International contest in France in 1990, and for twenty-five years they have been quartet in residence in Boston at the New England Conservatory of Music and the Isabella Stewart Gardner Museum; they are also on the faculty of the Taos School of Music Chamber Music Festival. They take their name from the Borromean Islands in Lake Maggiore, Italy. Nicholas Kitchen, first violin, one of the founding members, is married to the other founder, cellist Yeesun Kim. Kitchen, born into a musical family in North Carolina, has been playing publicly since childhood. He studied extensively at the Curtis Institute with veteran Szymon Goldberg, among others, and has performed as both a soloist and a chamber musician around the world. He is deeply interested in multimedia musical presentation, and has also expanded the quartet’s repertoire by his transcriptions for strings of Bach keyboard masterworks, including The Well-Tempered Clavier and the Goldberg Variations. Second violinist Kristopher Tong is the newest quartet member, having joined in 2006. He was born into a family from Hong Kong who had emigrated to Binghamton, New York. The family moved to Utah, and Tong began his musical life when he was named concertmaster of the state’s Youth Symphony at age fifteen. He completed his master’s degree at the New England Conservatory in 2005, then joined the quartet. Violist Mai Motobuchi was born in Tokyo and has been playing since she was five years old. She won first prize in the All Japan Youth Music contest in 1989, and the All Japan Ensemble contest in both 1990 and 1991. Motobuchi won a scholarship to study in the United States, and joined the Borromeo in 2000. Cellist Yeesun Kim, who plays a sixteenth-century cello, one of the oldest in the world, made her debut in her native Korea at thirteen, won several awards, and came to the Curtis Institute, where she met Kitchen. She is much in demand as a soloist as well as a chamber musician, and she and her husband play together frequently as a duo in addition to their work with the Borromeo. The Lincoln Trio, described by The Strad magazine as “sensational… bewitching,” was formed in 2003 in Chicago, and has quickly become renowned both for its performances of the classical piano trio repertoire and its adventurousness in performing and recording new works. A reviewer called it “one of the hottest young trios in the business.” It takes its name from its native state’s motto as the “Land of Lincoln,” and the trio was chosen to perform at the Abraham Lincoln Bicentennial celebration in Springfield in the presence of President Barack Obama. Its members have all performed as soloists in their own right with major orchestras around the world. As a trio they have been heard at most of the notable American festivals and have toured Europe, Asia, and Latin America. Their recordings, particularly of contemporary music, have been widely praised and one (which included the Higdon trio they are performing today) received a Grammy nomination. The Lincoln are currently artists-in-residence at Chicago’s Merit School of Music. Higdon publishes her own music with the assistance of her longtime companion, Cheryl Lawson. She won a Pulitzer for the violin concerto she wrote for Hilary Hahn, and has been awarded two Grammys. A Brooklyn native, she was brought up in Kentucky after her hippie family moved there, and was a very late starter in classical music. Higdo taught herself the flute in her teens, but did not begin to compose until she was at the Curtis Institute of Music, studying with Ned Rorem. She also studied with George Crumb at the University of Pennsylvania. A survey recently showed her to be one of the most frequently performed of living American composers. One piece, Blue Cathedral, a tone poem she created on the premature death of her younger brother, has been performed no fewer than six hundred times since its premiere in 2000. Higdon’s Piano Trio No. 1, dating from 2003, has two movements, characterized by the colors in the composer’s mind as she wrote. The first, “Pale Yellow,” is strongly lyrical, opening with pensive piano chords that are soon joined by a chant from the cello before the violin enters. The movement moves quietly and sweetly, like its color, until a strong climax bursts into gold; then the music simmers back into more subdued tones. The second movement, “Fiery Red,” as its name suggests, is very different, a propulsively virtuosic piece that bears echoes of Bartók. It’s easy to hear the flickering of flames in the music, the sudden eruption of fire, the constant susurrus and crackle of burning wood or coal. The trio packs a great deal of color into its roughly fifteen minutes’ duration. If ever there could be said to be a Grand Old Man of French music, it would be Gabriel Fauré. His long life of nearly eighty years spanned the era of Berlioz and Chopin and lasted into the jazzy modernism of Les Six in the 1920s. Learning from Camille Saint-Saëns, Fauré was himself a great teacher; he numbered Jacques Ibert and Ravel among his students and later on, Nadia and Lili Boulanger and Florent Schmitt. He was certainly capable of wonderfully lyrical melody (as in his “Pavane” and Requiem and some exquisite songs), but his music is for the most part restrained, sensuous, and gentle. Perhaps his skills as an accomplished organist contributed to the dark hues that suffuse much of Fauré’s work. He became increasingly deaf as the years wore on; by the time his only piano trio was premiered, he had to be turned, like Beethoven, to accept the applause his work inspired. Fauré was at first was reluctant to begin composing the trio, telling his wife he felt too exhausted to write another note; soon, however, he became deeply involved. He originally intended the treble instrument to be a clarinet, but soon dropped that notion. The Piano Trio in D Minor, Op. 120, is one Fauré’s mature chamber masterpieces, packed full of subtle invention and with a lifetime’s experience behind the intricate weaving of the sound. The strings have the rather elegiac first theme, the effect somewhat like that of a boat moving through water. The piano introduces the second theme, like a chiming of bells. Then, after some rich interplay, the roles are reversed to create a dazzle of coloristic effects. It’s easy to see how Ravel came by his chamber style when you hear Fauré. The second movement, the longest, is more strongly melodic. The first theme is intoned by the violin and cello together, with the piano gently accompanying. This sense of a piano accompaniment is even stronger in the central section, where the strings sound almost like singers in recital. Their song dissolves into counterpoint, only to re-emerge and finally fade into a wonderfully peaceful and pensive conclusion. The finale is altogether different, quickly accelerating from a slow and dark beginning to a strongly rhythmic momentum that hardly lets up for the rest of the movement; it’s probably as close as Fauré ever came to a rustic dance, and it leads the trio to a resounding finish. Daron Hagen is a musical jack of all trades—a composer in both acoustic and electronic forms, a teacher, stage director, conductor, librettist, and pianist. Unlike Higdon, he was an early starter, writing his first compositions at age thirteen before going on to study with Ned Rorem at the Curtis Institute and David Diamond at The Juilliard School. Hagen has composed in most forms—five symphonies, twelve concerti, more than three hundred art songs and cycles—but perhaps it is for his operas that he is best known. He has written nine so far (his Amelia was described by Opera News as “one of the best of the twenty-first century”) and is at work on a tenth, this one set inside the head of Orson Welles. Hagen has won many awards, including one from the Academy of Arts and Letters, and plentiful foundation grants and residencies. He has taught at Bard College, the Curtis Institute, and NYU, and currently lives in Rhinebeck, just across the river from Maverick. Hagen’s Trio No. 4, “Angel Band,” is a tribute to virtuoso violinist Joyce Strosahl (1918–2012), who grew up in the bluegrass country of Kentucky and later became a major figure in the musical life of Washington State. The music revolves around the bluegrass gospel hymn “Angel Band,” which is referred to throughout the quartet’s five movements and follows Strosahl from youth to old age. The first, “Morning,” is the simplest, in which the tune is given four variations. “The Violinist on the Pont Neuf” offers a light-hearted Gallic waltz. “Rondo,” a complex contrapuntal working out of the old song at a higher dramatic level, suggests the tensions of middle age. “Blue Chaconne” presents the theme six times in varying guises, and moves without a break into the “Finale,” in which themes and decorations from all the movements are combined in a virtuosic series of variations. Maurice Ravel had long thought of writing a piano trio before he finally sat down in 1914, on the eve of World War I, to compose one. Characteristically, he had planned its structure in elaborate detail in his head in advance of composition, joking, “Now all I need is the themes.” He began writing it in the Basque country of his birth, and Basque themes originally intended for a piano concerto that never materialized pervade the work, particularly the first movement. Ravel wrote slowly at first, but when war was declared he hastened the the pace of composition so he could join up. He wrote to Stravinsky, “The idea that I should be leaving at once made me get through five months’ work in five weeks!” In the end, his slight stature and age (he was forty) precluded army service, but he became an ambulance driver and was wounded. The Piano Trio in A Minor begins with a Basque-style rhythmic pattern, an eight-beat meter divided into twos and threes. The effect is of independent motion free from bar lines. The strings play in widely spaced octaves, with the piano filling in the middle, skillfully ensuring that it does not overpower the strings. The scherzo, based on a Malayan verse form popular among French poets of the period, offers a stylized series of repeated motifs. Ravel’s writing is highly colored, with pizzicato effects and tremuli similar to those heard in his quartet. The slow movement is a passacaglia, a theme and variations built around a repeated bass melody, and opens with low piano sonorities akin to those in the unforgettable opening of the composer’s Piano Concerto for the Left Hand. This idea is soon taken up by violin and cello, and the music rises to an intensely affecting climax. This forms the heart of what can otherwise seem an emotionally elusive, if gorgeously decorated, work. People have searched in the trio for a sense of the impending disaster of the war, but perhaps only in the fierce vigor of the finale can this be sensed. It begins with a dazzling splash of color, then embarks on a series of heroic gestures, far from the meticulous shadings of the earlier movements, and ends in a triumphant blaze. It is as if Ravel is finally setting off to war.